Last week I showed you my first beaded rope of the summer, a pretty variant on Russian spiral. This week, I've got a plain peyote rope that I embellished for some extra fun. 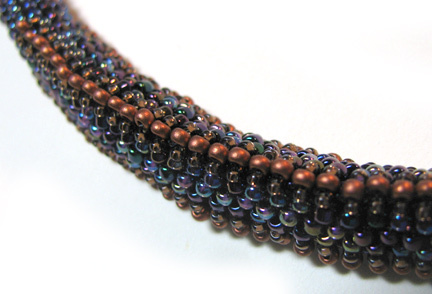 It was super-simple, and you could make it in any color and size of seed beads that you want! Just use all the same size, and as many colors as please you. 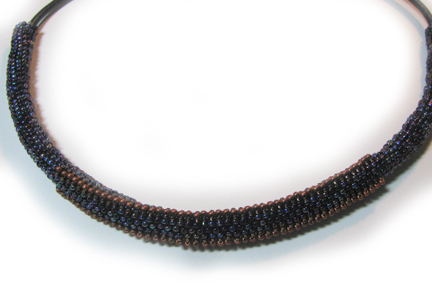 I chose size 11/0 seed beads, and worked with purple iris as the base rope and matte copper as the embellishment beads. I chose to slide it onto a black cord necklace with a clasp already attached. So easy! 1. String on 12 seed beads and make a ring. Leave a 4 to 6" tail to weave in later. 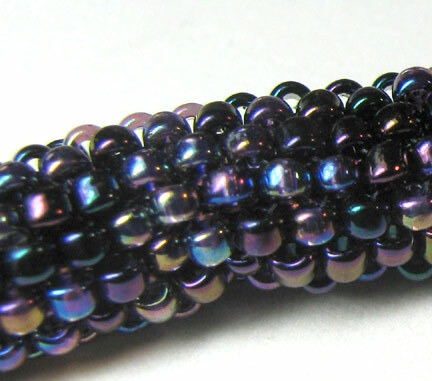 You will be adding 6 beads in each round of peyote stitch: pick up a bead, skip a bead in previous row, stitch through the next bead in previous row. Repeat around and "step up" through the first bead added in each row to start the next row. 2. When the rope is as long as you want it, weave your thread end back into the work on both ends. 3. Measure to find the center of the rope. Measure out from there to find where you want to start and end your embellishments. This is assuming that you don't want to do the entire length of the rope, which is also fine! 5. When finished, I simply slipped my rope onto the black cord necklace.